The split coil sounds add some versatility, but make no mistake, prog-metal rhythm is the order of the day here. Almost the dream seven- string prog/metal rhythm guitar: power, punch and clarity. Missing the comfort contours of contemporary shred machines; positioning of the three-way selector. 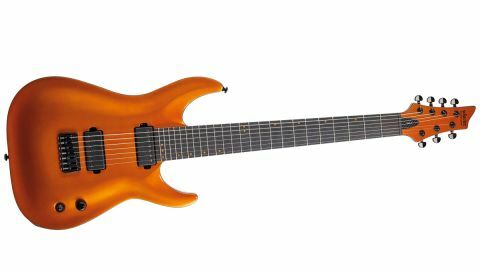 The KM-7 is the signature model of prog- metal player Keith Merrow who, although a solo artist in his own right, is perhaps best known as a guitar product demonstrator. It may seem strange that a relatively unknown recording artist should warrant his own signature guitar, but YouTube sensations and prolific gear demonstrators are these days arguably as influential as established artists when it comes to persuading us what our next purchase should be. Out of the box, it feels very lightweight with a slim body depth. Our review model is labelled 'Lambo Orange', which isn't actually as polarising as you might think, with the black hardware and dark ebony fingerboard providing a nice contrast. It also features a carved body that, although not as pronounced the Hybrid, still makes its presence felt when resting your right arm on top to facilitate those two-handed tapping gymnastics - not by any means uncomfortable but maybe highlighting the fact this hasn't been designed purely as a 'shredder's' guitar, despite its appearance. "Our review model is labelled 'Lambo Orange', which isn't actually as polarising as you might think..."
Deference is given to the extended range provided by the low B in the form of a longer scale length (26.5 inches - one inch longer than the standard Fender scale). A longer scale length scale may deter players with smaller hands, but those who play extended range guitars can vouch that the intonation is more accurate on the lower strings due to a higher tension. Either way, there was no discernible drawback felt by this writer: neither visually nor in terms of playability. The KM-7's appearance overwhelmingly suggests a very metal- inspired tone trip is in store and we were ready to turn down the gain on the Cornford MK50H II head providing our sounds. Once plugged in, though, our trepidation vanished. Both pickups possess enough power and punch to accentuate that low B while retaining enough subtlety to offer balance and clarity on more expansive chord work. "The split coil sounds on offer work particularly well, too, and offer a very Nuno Bettencourt-like aggressive funk sound, which adds further colour to its sonic palette." You get the impression that a lot of thought has been put into achieving this, as the natural brightness of the swamp ash body and ebony 'board work well without the muddiness produced by some lower range instruments. The bridge pickup performs particularly well for progressive metal styles and the punchy roundedness on low single-note riffs is very well defined, with the neck pickup performing in much the same way, albeit with a warmer sound. The split coil sounds on offer work particularly well, too, and offer a very Nuno Bettencourt-like aggressive funk sound, which adds further colour to its sonic palette. But for clean work we have an almost perfunctory sound. The lower strings actually have a frequency response similar to a flat wound bass, which actually works very well for jazzy chord/melody playing - the genesis of the modern seven- string guitar, of course.